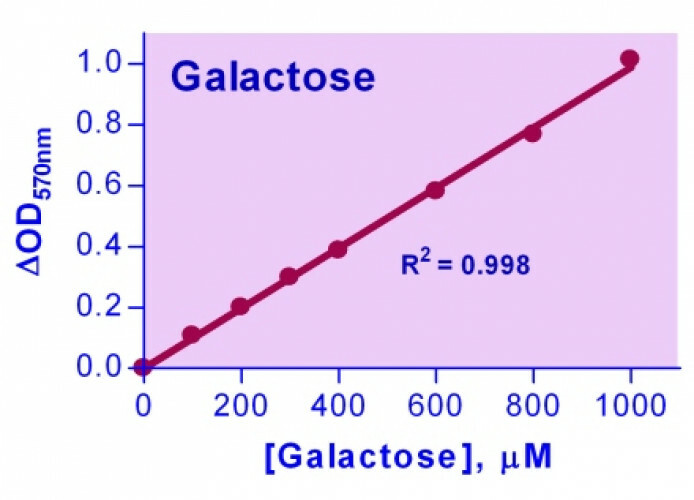 For quantitative determination of galactose and its metabolism. • Use as little as 20 μL samples. Linear detection range in 96-well plate: 10 to 1000 μM galactose for colorimetric assays and 10 to 100 μM for fluorimetric assays. Galactose (C6H12O6) is a monosaccharide that is found in dairy products, sugar beets, gums and mucilages. It is also synthesized in mammals, where it forms part of glycolipids and glycoproteins in several tissues. It forms the disaccharide lactose when combined with glucose. Simple, direct and high-throughput assays for galactose determination find wide applications. BioAssay Systems’ assay uses specific enzyme-coupled reactions to form a colored product. The color intensity at 570nm or fluorescence intensity at 530nm/585nm is directly proportional to the galactose concentration in the sample. 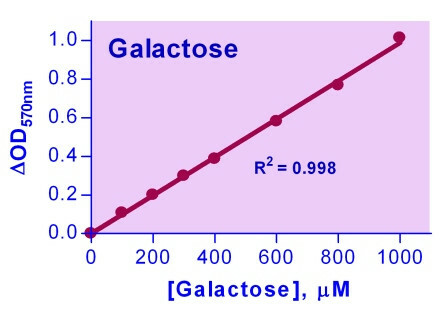 Applications For quantitative determination of galactose and its metabolism.